Your law firm faces many important challenges. Two of the biggest: continually developing an inventory of solid cases and growing your practice. The first requires a lot of resources, making it difficult to stay focused on the second. This means you have to balance near-term success with the long-term health of your firm. 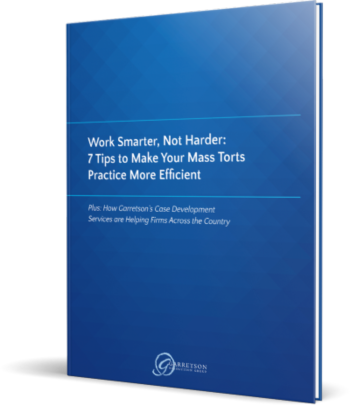 But what if you could take the data gleaned from case development and put it to work for your firm? Are you gathering and managing information in a way that helps you understand why some cases are more successful, and where they come from? The facts you get from clients can do more than just help you prove up cases; if you obtain the most effective information and analyze it in detail, you can use the resulting knowledge to enhance your practice and achieve stronger results going forward.